Yes, GATEWAY BEERS. Maybe you noticed some strange things happening with your son and/or daughter. Leaving craft beer magazines lying around the house, starting a collection of coasters or glasses from brewpubs and microbreweries or even having a schedule of beer events happening WITH SEVERAL OF THEM CHECKED OFF OR CIRCLED. Yes, there’s no way around it. Your kid is a Beer Fiend, a Hophead, a Malt Maniac, a Liberal, or whatever the hell kids are calling them these days. And it was all thanks to that damn Lambic! Basically, this was inspired by the friends and family I have who have said “I don’t really drink beer, but when I do I usually drink _______. What should I have?”. But you know what? Today I feel reckless. Today I don’t think I’m going to go with the template of “I usually drink ________”. Today I’m going to just suggest a type of beer that you HAVE TO TRY before you die. I am talking of the holiest of them all, the Trappist Beers. Cue the music to play along while reading this! Trappists, also known as The Order of Cistercians of the Strict Observance, are an order of Roman Catholic contemplative monks who follow the Rule of Saint Benedict to the letter and have taken a vow of stability, fidelity to monastic life, and obedience. While they don’t go so far as to take a vow of silence, talking too much IS discouraged. Apparently speech disturbs a disciple’s duty for quietude and receptivity, and may tempt them to exercise their own will instead of the will of God. A special sign language was created to further discourage speech and all meals are spent quietly listening to a reading. There are about 175 monasteries and convents in the world and most of them make stuff! Turns out the Rule of St. Benedict encourages the monks to produce stuff with all income going to the monastery! This stuff ranges from clothing to food to toys…and BEER (which works because the monks don’t abstain from alcohol or think it’s particularly wrong). In response to breweries, clothing companies and other non-Trappist purveyors abusing the Trappist name by calling their product Trappist, the International Trappist Association was formed which put a smackdown on the fakers and set up some strict rules to determine what is worthy of getting the “Authentic Trappist Product” sticker on their product. 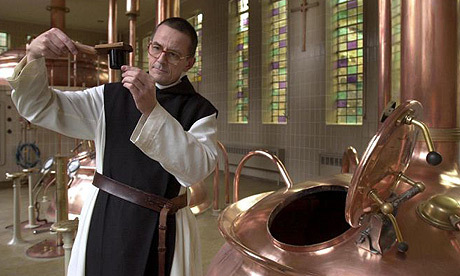 The beer must be brewed within the walls of a Trappist abbey, by or under control of Trappist monks (although this has been stretched to allow outsourcing to breweries outside of the abbey as long as the ENTIRE process is overseen by the monks). The brewery, the choices of brewing, and the commercial orientations must be of secondary importance within the monastery and should reflect the monastic way of life. Profit is not a goal. Money received from sales goes towards the living expenses of the monks and building and maintenance of the grounds. The rest goes to charity. Trappist breweries must be constantly monitored to ensure the best of quality. And if any one of those rules are broken BAM, The sticker comes off and they are no longer considered Trappist. But why is that considered a big deal? After all, There are thousands of Abbey breweries out there. This is true…but there are only seven Trappist breweries in the entire world (six in Belgium and one in the Netherlands), so staying on that list packs a lot of prestige. Now I’m going to go through the seven breweries and say what I can about them. Keep in mind that, due to limited availability, there are several that I have not tried and therefore won’t be able to comment on them. Though with that it should be said that trying all the Trappist beers is something that should be put on your bucket list. Bières de Chimay: Comes in three different, wonderful colours.White, Red and Blue. Chimay Red Cap was actually the very first craft beer I ever tried and the complexities just blew my mind. First brewed in 1862, Chimay Red Cap has a lovely copper colour, sweet apricot aroma and a taste that reveals the fruit nuances and delicious malts. These folks also put more in to advertising than any of the other breweries and with their easy availablity are often a gateway in to the world of Trappist beers. Brasserie d’Orval: This brewery makes two beers; one for the public and one just for the monks (but can also be purchased at the monastery itself or the cafe near it). The public one, Orval, has a light cloudy colour, is somewhat high in carbonation and with a spicy, leathery aroma. Taste is sweet with some citrusy tones and a distinct note of pear and apple. Slight hoppiness due to dry-hopping during the three-week maturation period. Also should be noted that the brewery uses a unique local wild yeast for fermenting. Brasserie de Rochefort: Never tried the three beers from this brewery. Rochefort 6 is only brewed once a year and is very difficult to hunt down, Rochefort 8 is their most popular brew and Rochefort 10 packs a punch with an 11.3% ABV, which I imagine adds some lovely distinctions to the flavour. A fun note about this brewery is that they obtain the water from a well within the walls of the monastery. Brouwerij der Trappisten van Westmalle: Westmalle makes three brews speculated to be based on the Holy Trinity. A Dubbel, a Tripel (the first golden strong pale ale to be called one) and Westmalle Extra, which is pretty rare. Not going to lie here folks, when I first tried Westmalle Tripel I actually wept tears of joy. The aroma is quite sweet, with hints of lemon zest, orange and sweet spices but the the taste is another matter. VERY creamy mouthfeel to it with such a complex flavour. Really, nothing I can say about the flavour will do it justice. Every time I try to do a tasting I’m just left dumbstruck. Combinations of sweetness, bitterness and earthiness combine to form a holy trinity on its own. For the love of all that is Holy (and these folks are pretty holy) try the Westmalle Tripel. Brouwerij Westvleteren: These folks do absolutely no advertising, make just enough beer to support the monastery and the only official sell points are the brewery itself and a cafe across from the abbey. Any other places you get it should be punished because once purchased the buyers are given their receipt with “DO NOT RESELL” on it. No pubs have it either. They have not changed the amount of beer they produce since 1946. This kind of thing brings out the romantic in me and makes me want to go on a pilgrimage. Brouwerij der Sint-Benedictusabdij de Achelse Kluis: The smallest of the breweries, the building of which was assisted by the monks at Westmalle and Rochefort. They brew six beers, two of which are available only on tap at the Abbey, one available in bottles only at the abbey and the remaining are distributed worldwide but to quite limited availability. I regret to say that I haven’t tried any of these beers, though I have been told that Achel Extra Brune, which seems to be their most popular beer, is “what a strong ale should be”, with a creamy mouthfeel and hints of rye, caraway, molasses and cloves. 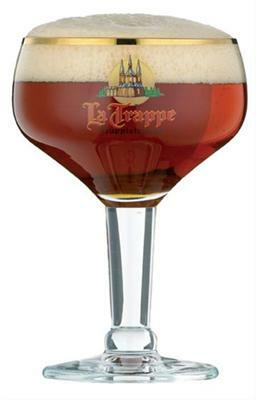 Brouwerij de Koningshoeven: More known as La Trappe. The only one of the Trappist breweries not based in Belgium, but in the Netherlands. While they make about seven beers plus one seasonal, in my experience the three most popular are the Dubbel, Tripel and Quadrupel. As luck would have it, a pub right down the street from my office serves all three on tap. The tripel has a rich, bittersweet taste with hints of pears and coriander while the quadrupel would have to be the sweetest of them all, with strong tastes of molasses, cloves, bay leaf, vanilla and raisins, a sticky mouthfeel and a very slight bitterness that only comes from it’s alcohol content (10%). A personal goal of mine is to try the oak aged batches of the quadrupel, which adds a whole new element to an already fantastic beer. PHEW! So that’s all of them. So here you have a group of breweries with a very rich history and a way of life that is so unique. Not to mention that by buying the beer, you know the money is going towards maintaining the monastery with the rest going to charity. In all respects Trappist beers are feel-good beers.